The Made Up Maiden: piCture pOlish Blog Fest 2012! 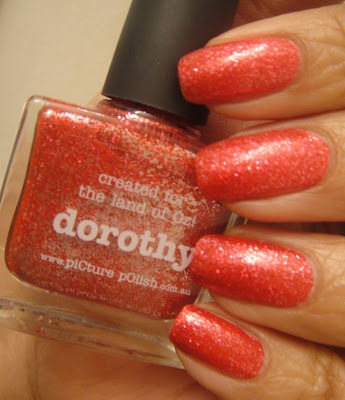 I have an extra special post to share with all of you today; welcome to piCture pOlish Blog Fest 2012! If you haven't heard of it before, Blog Fest is where piCture pOlish nail polishes are being reviewed on blogs all around the world, all on the same day, the 30th of July. It's also the day where brand new shades are released, so it's a very exciting day indeed! The lovely ladies at piCture pOlish sent out a request in early June for beauty bloggers who were keen on participating in Blog Fest 2012, and I was lucky enough to be chosen and sent two brand new shades to review! It was thrilling to participate not just because I love the brand, but also because many of my favourite bloggers have participated in previous years. 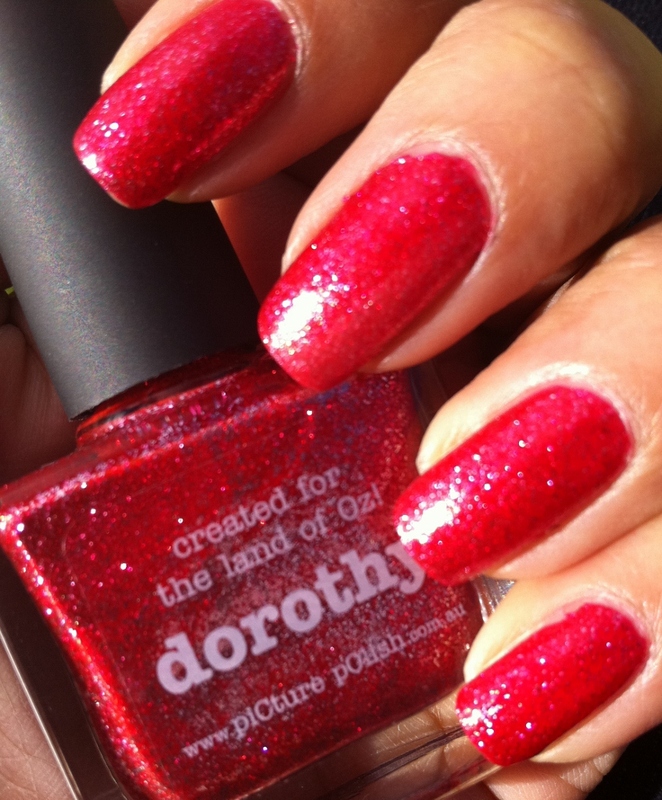 Without further ado, let me introduce you to two very gorgeous shades; Dorothy and Attitude! Dorothy is a new 'Mesh' shade; a gorgeous scarlet glitter with lots of red and silver microglitter particles. 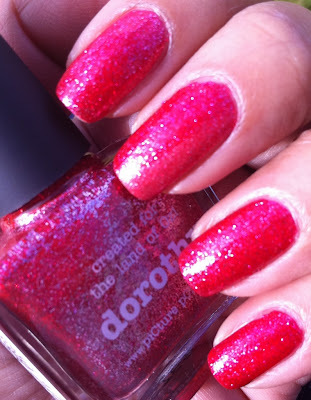 It's aptly named as I think of ruby red slippers every time I look at it! I find that the intensity of colour changes depending on the lighting. It was really easy to apply and so opaque that I could probably have gotten away with just one coat, but I used two out of habit. It does get a little thick after a while, but it's nothing that a drop or two of polish restorer/thinner won't fix. 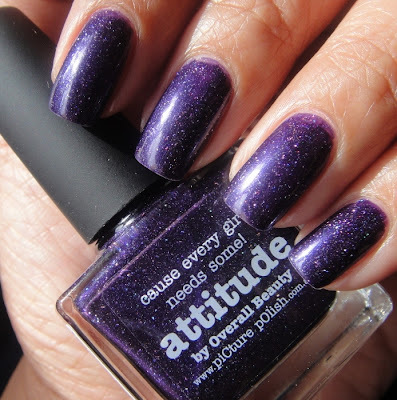 Attitude is a beautiful aubergine creme polish with scattered holographic microglitter particles, it's simply too stunning to put into words. 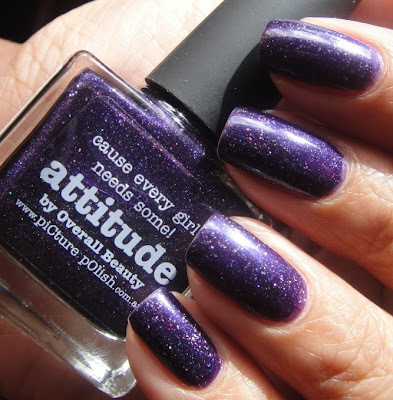 Attitude was formed between Kim from Overall Beauty and piCture pOlish, and is part of the new 'Collaboration Collection'. 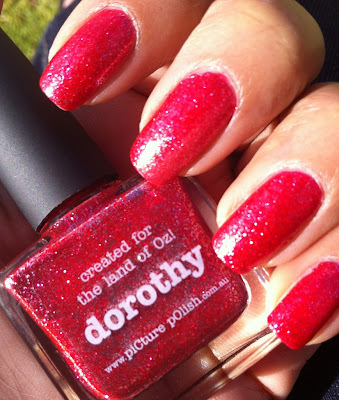 This polish is a little thinner and a bit streaky compared to Dorothy, so I used three thin coats to achieve the perfect finish. With flash to show the holographic glitter. Both polishes are great quality polishes that apply beautifully and last quite long on nails without undue tip wear. They also dry very quickly with Poshe topcoat applied on top. I love the bottles as the square design makes for easy, efficient storage, and you get a generous 11 ml in each bottle. 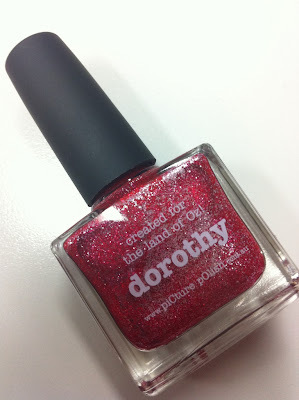 Dorothy retails for $9.50 while Attitude retails for $11.50, which I think is reasonable, given that OPI is generally retails for almost $20. 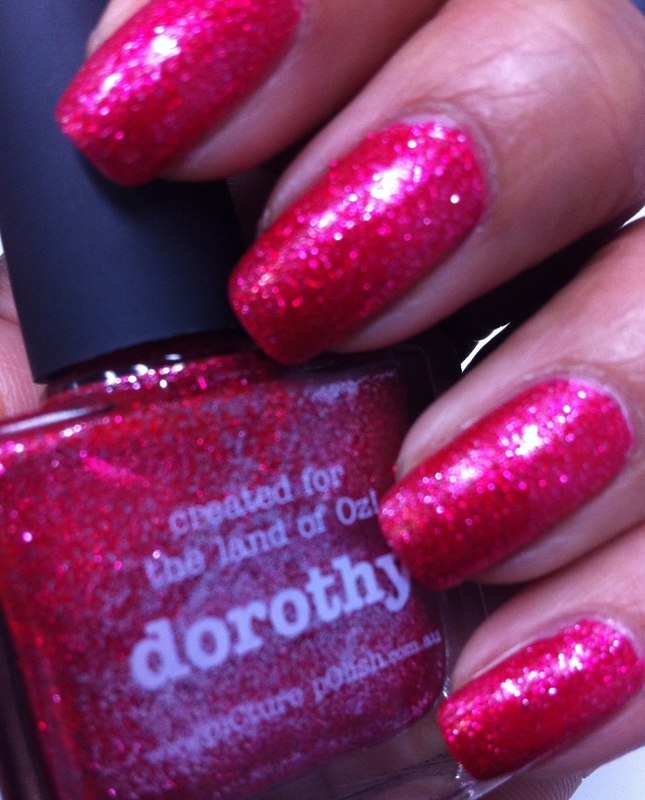 Dorothy is available from the website (which ships internationally) and from all Network members (if you're not based in Australia, just look for a Network member in your country) while Attitude is available exclusively from their website or from Overall Beauty. The polishes are made in Australia and there are QR codes on each bottle so you can scan it and it takes you directly to the website or the Network member it was purchased from. You can also find piCture pOlish on Twitter, Facebook and Pinterest. Will I be purchasing more polish from piCture pOlish? I certainly will, and I already have a wish list including shades like White Wedding, Kryptonite, PMT, Denim and Wisteria (don't you just love the names?). Note: These samples were kindly provided for my consideration. This has not affected my opinion in any way. For more information, please refer to my Disclosure Policy. Nice swatching! 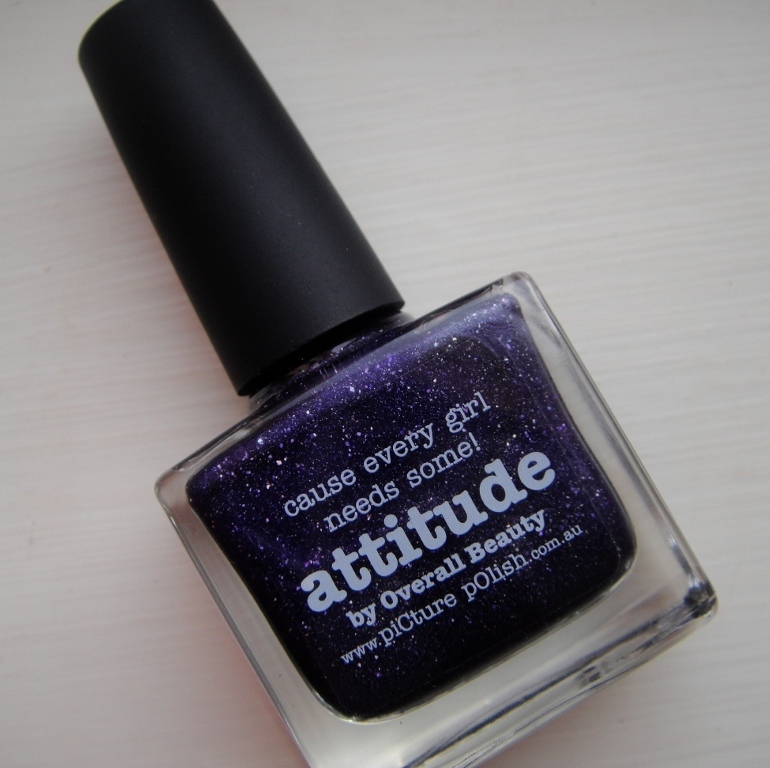 I want Attitude now... goodbye wallet! Thank you! I know, it is so tempting to just go crazy! oooh the Attitude is beautiful! Yes, it's stunning, isn't it?! Thank you! I know what you mean but it's soooo tempting! Thank you so much, and yes, they do change colour! Which makes them so hard to swatch sometimes lol. I think the new Mesh shades are beautiful - great swatches! Great swatches. Both of these two are gorgeous. Love all the new PP shades. Thank you so much, hun...it means so much coming from you! I love Kryptonite! 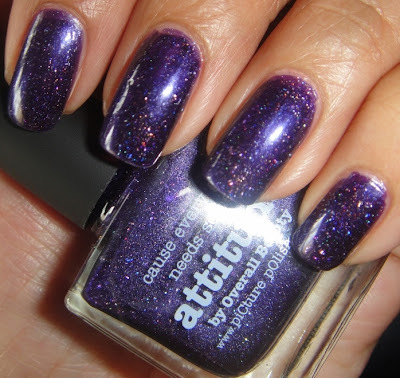 I love amethyst gorgeous swatches! Product Review - Remington Tribal Compact Tong!